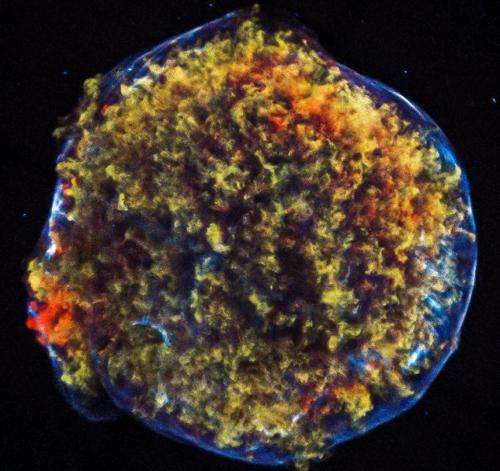 More than four centuries after Danish astronomer Tycho Brahe first observed the supernova that bears his name, the supernova remnant it created is now a bright source of X-rays. The supersonic expansion of the exploded star produced a shock wave moving outward into the surrounding interstellar gas, and another, reverse shock wave moving back into the expanding stellar debris. This Chandra image of Tycho reveals the dynamics of the explosion in exquisite detail. The outer shock has produced a rapidly moving shell of extremely high-energy electrons (blue), and the reverse shock has heated the expanding debris to millions of degrees (red and green). There is evidence from the Chandra data that these shock waves may be responsible for some of the cosmic rays – ultra-energetic particles – that pervade the Galaxy and constantly bombard the Earth.